Kirito settles into a pleasant routine, waking up in the church, going to work with Eugeo, eating stale bread. He wants to get to the Central City, but knows the only way is through the Gigas Cedar. When he asks Eugeo if there’s anything stronger than his ax, Eugeo produces the Blue Rose Sword, which he retrieved from the End Mountains where he lost Alice. Kirito uses his latent sword skill to make an immediate mark, albeit in the wrong place, while Eugeo can’t make a scratch. A dead end, or a simple matter of persistence? Eugeo brought the sword home in hopes of learning to wield it, but laments that when the Integrity Knight came for Alice, he wanted to do something, but just couldn’t move. That night Kirito has a chat with Selka, whom he learned is Alice’s younger sister. Selka doesn’t like how Eugeo’s mood darkened after Alice was taken, especially when it came to her. It wasn’t her fault her sister was taken, so why can’t he be friendly with her? Kirito doesn’t have the answers, but does tell Selka that it’s fine to cry whenever one feels like it. Unfortunately, he also tells her something she never knew: why Alice was arrested by the Axiom Church. That new information sends her to the End Mountains, all alone, perhaps in hopes of committing the same crime and reuniting with Alice, as farfetched as that seems. As she left before dawn, she gets a good head start on Kirito and Eugeo, who rush off after her. Apparently they mount this rescue at a time when Eugeo doesn’t have to chop at the Gigas Cedar, otherwise he’d be shirking his calling and risking justice. 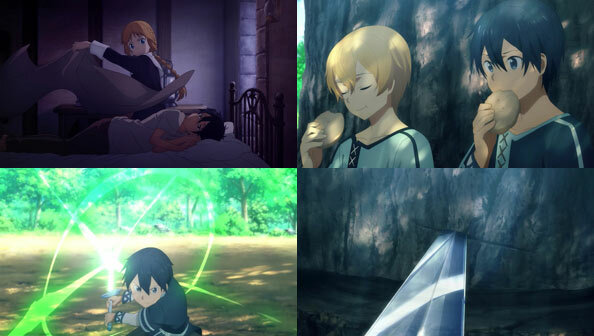 When Eugeo uses System Call to illuminate a cattail, it surprises Kirito; characters are using RPG-style interfaces in a virtual world. 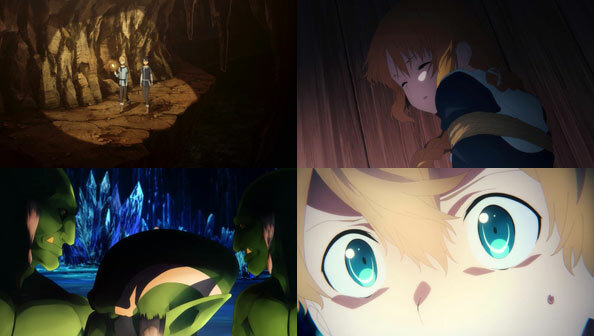 When they reach the main chamber where the bones of the dragon lie following Selka’s scream, Kirito and Eugeo discover that she’s been captured by—you guessed it—a band of goblins. Figures. Unlike those of Goblin Slayer, they seem content to sell Selka rather than use her as their plaything, but are only interested in selling the meat of males like Kirito and Eugeo. 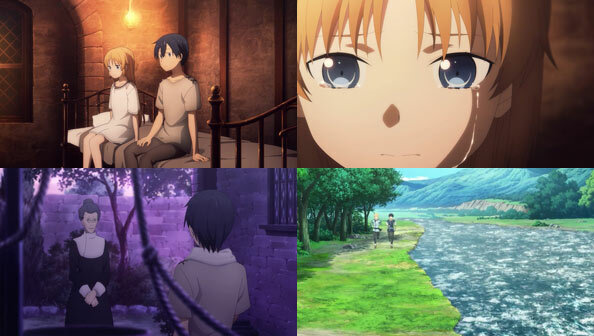 Eugeo gives away their position, but as the goblins advance, he suffers another acute case of fear paralysis, which means an unarmed Kirito will likely have to deal with the horde all by his lonesome.